Ignominious Incarceration is a band confused. Whilst the record does exhibit performances from each member that merit excellence, there are the usual suspects of clumsy song writing and poor riff progressions that plague their overall technical prowess. 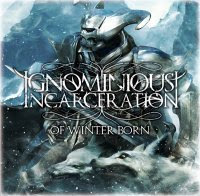 Of Winter Born, is Ignominious Incarcerations debut release, with the band being in partnership for over two years. And whilst talented musicianship can be found throughout this entire record, collectively there are many question marks. There is a guarantee that each track will have there plausible moments and oblivious ones. This sort of tedious repetition is at best, met with a frustrating listen and proves all the more aggressive if they’re trying to anger fellow listeners. The first half of the album is a less intensive affair than it’s other half, with events picking up on the self titled ‘Of Winter Born’ mid way through. The entries are well constructed, that are as technical as modern death metal needs be, but are far too indulgent on using the same elements heard on previous tracks. An EP may have been a better showcase, as the restrain of repetition for the sake of 35 or so minutes, feels like a wasted opportunity. ‘Of Winter Born’ is a technical workout, that does work a sweat and will prove an eye catcher for some (whether that is the 2 minute decent riffing, the superb production or striking artwork). However its clumsy design met with an immature aggression, burden what could have been a saturated Extended Play. Of Winter Born, is fairly ignominious.